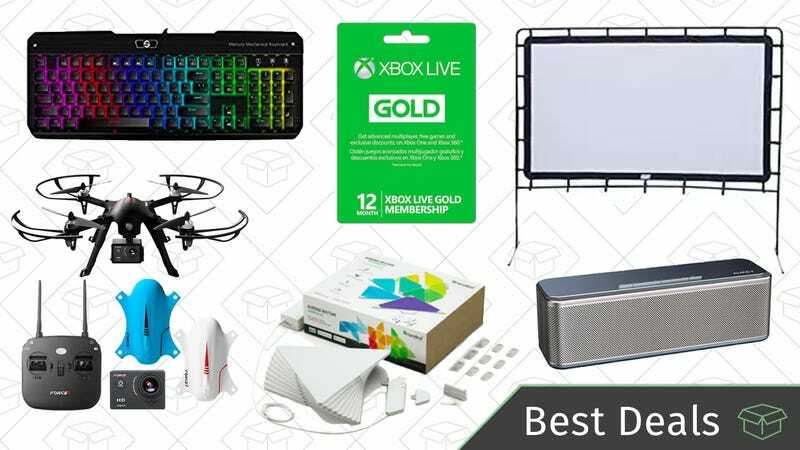 Score deals on 12 months of Xbox Live Gold, an artistic smart lighting system, laundry pods, and much more. $100 camera drones aren’t all that uncommon these days, but most of those cameras could be charitably compared to smartphones circa 2009. They produce images, yes, but maybe not anything you’d want to look at. The Force1 F100 Ghost Drone though includes a 1080p action camera that actually looks pretty good, but you can also swap in a GoPro HERO3 or HERO4 in its place for even better shots. Plus, you get a couple of extra shells and two batteries. There’s no gimbal, and the range won’t compare to a DJI drone, but for $100, it’s a solid package. Just note that this is a Gold Box deal, meaning this price is only available today, or until sold out. $32 is a pretty good price for any 45W USB-C Power Delivery charger, but this one also includes four regular USB ports for phones, tablets, and the like. It’s a little too big for travel, but it would be great for a desk or nightstand where you charge a MacBook, Nintendo Switch, or any other USB-C-powered gadgets. Save $11 at checkout with promo code KINJAXY1. Verizon just kicked off a big sale offering up to 50% off the latest and greatest phones when you trade in another device. As you might expect, there are a lot of caveats, and Lifehacker broke them all down here. But if you have an eligible device to trade in, and don’t mind sticking with Verizon for two years, this could be a great opportunity. Anker makes smart plugs now, because Anker makes everything, and the compact model is down to an all-time low $19 today, while supplies last. It’s almost barbecue season, and you can be ready with a set of Char-Broil potato screws, now marked down to an all-time low $8 for six. As you might have guessed from the name, you screw these stainless steel corkscrews into potatoes, and throw them on the grill. The screws make them easier to grab with tongs or gloves, and help transfer grill heat to the inside of the potato, which makes them cook faster. Amazon makes its own snacks now, and a bunch of them are on sale today for some of the best prices we’ve seen. The giant bags of various nuts are a no-brainer purchase, but you’ll also find some snack-sized packs, herbal tea, and several flavors of matcha green tea powder, which is a superfood that you can add to just about everything. This Sterline spiralizer can cut your favorite fruits and vegetables into versatile stings and strands, and includes three different blades, and even suction cups on the bottom to keep it locked to your counter. Today’s $10 price tag (after clipping the $1 coupon) is one of the best prices we’ve ever seen on one of these things, making it the perfect gift for the home chef who has everything. While supplies last, Amazon’s running an extremely rare $5 discount on a collection of 12 succulent plants shipped right to your door. Each plant is unique and comes in a 2" pot, but many of them will be ready to transfer to a larger arrangement. Just remember, the green ones do well indoors, while purple and orange plants will be happier on your patio. Gorilla ladders are some of the most highly regarded out there, and when it comes to buying ladders, you don’t want to skimp. This 22' model can support nearly 400 pounds, and can be used in a ton of different positions to suit your needs. At $99 from Home Depot, it’s an absolute steal. Keep out the sunshine with the help of these discounted AmazonBasics blackout curtains. They have several color and size options to pick from with prices ranging between $21 and $31, a good $10 - $20 discount from the usual. Unfortunately not all the color and size combinations are on sale, so we’ve highlighted a couple of options in this post, but if you’d like to see them all, head over to Amazon. These containers come in six different sizes, and yet you only have to deal with three different lids, making it much easier to find the right one. The 42 piece set is on sale for $17 today on Amazon. We’ve seen better prices in the past, but this set has been selling for around $20 pretty consistently this year, so this is worth picking up if you have a need for it. Get it for $12 today with promo code 4STI6479, matching a deal we saw on it back in February. No matter your favorite flavor of Tide Pod, it’s probably discounted with today’s $3 coupon on Amazon. Most of the deals require a Prime Pantry order, but these two do not. There’s also a Gain Flings option included in the sale, but let’s be honest, that’s like a Newman-O to Tide’s Oreos. Save a couple of bucks on this pack of four multi-functional silicone kitchen pads, which can be used as pot holders, trivets, jar openers, and spoon rests. You can even wrap one of these around a clove of garlic, roll it around for a few seconds, and you’ll have peeled garlic. Nifty! These are priced about $2 less than they usually are, so why not? Very similar to the best-selling Takeya cold brew coffee maker, this carafe makes 1.3 quarts of highly-concentrated, cold brew coffee without most of the acidity of traditionally-brewed coffee. After you clip the $1 off coupon, this is only $17 today, which means this thing will pay for itself very quickly if you’re used to buying cold brew at coffee shops. When you’re not using it for coffee, you can fill the mesh insert with fruit or tea bags for homemade infused water and tea. A good hand vacuum is just one of those things every home needs, if only for cleaning up quick messes without plugging in a full-sized vacuum, or vacuuming up car seats where a real vacuum can’t reach. This one from Black & Decker is just $30 today, the best price ever. Snag yourself one of these Sunbeam wraps to soothe sore muscles without straining your wallet. The larger wrap heats and massages, and will cost you just $39 today, matching the best price ever. The smaller wrap doesn’t massage, but does have four temperature settings, plus is discounted ~$8 today. Baubax is back with its second multifunctional jacket, the Go Go Gadget Jacket the Baubax 2.0, and you can save by preordering as its stupid-successful Kickstarter campaign winds down. The Baubax 2.0 is actually a line of four different jackets: a hoodie, a bomber, a windbreaker, and a vest, but all four feature most of the line’s impressive list of over 25 features (though each has at least one omission). Now, a lot of those features could be categorized as different sizes of pockets, and indeed, these jackets have a lot of pockets, especially on the inside. But a few others are really unique. There’s the retractable keychain (not included in my sample), the microfiber cloth tethered to a pocket, the zipper with a detachable pen and stylus. They all even hide inflatable neck pillows inside the hood (tucked underneath an eye mask, naturally). It’s a little bulky to keep inside the hood all the time, but it’s a clever storage solution when you’re traveling. You can head over to Baubax’s Kickstarter page to see all of the features in action, and then preorder the jacket of your choice for $129-$149, depending on the style, with delivery estimated for August. Amazon’s back at it again with another sample box, this time featuring 10 more samples of high-end men’s grooming supplies for $20, plus a $20 credit that you can spend on eligible items afterwards. Assuming you use the credit, that’s like getting samples of fancy shaving cream, toothpastes, colognes, and more for free. Even without discounts, Dorco offers some of the best deals in shaving, and now you can try their six-blade Dorco Pace 6 razor for just $10, complete with a handle, six cartridges, and even some shaving cream. Just use promo code KINJA43X at checkout to save $10. Add these angsty 80's classics to your Blu-ray collection for $15, or just $5 per movie. This set includes The Breakfast Club, Sixteen Candles, and Weird Science, so you can watch all the quirky awkwardness and be grateful your teenage years are behind you. If you can’t wait for Avengers: Infinity War to come out, you can pass the time with this awesome LEGO set, now back in stock for $56, or $14 less than MSRP. You get the Guardians of the Galaxy ship, Iron Man, Gamora, and Star Lord mini figs, a Thanos big figure, and of course, the Infinity Gauntlet and detachable Infinity Stones. Naturally, you can integrate this with other LEGO Avengers set, and the ship even includes an attachment point for the Guardians of the Galaxy Mining Pod included in this set. While it may lack some of the name recognition of other gaming peripheral manufacturers, this UTechSmart mechanical gaming keyboard has great user reviews, fully customizable backlighting, and a price tag of only $60 with promo code BOQ86MDD, which is a great deal for the features you’re getting. This is from the same company as the cult-favorite UTechSmart Venus MMO mouse, if aren’t sure of the company’s bona fides. If you’re going to buy a console from the 3DS family in the age of the Nintendo Switch, the New 2DS XL is probably the one you should get. It normally costs $150 (half the price of a Switch), but Amazon’s marked that down to a $130 today, which leaves you with an extra $20 to spend on SNES Virtual Console titles.